If all goes to plan, a fiery Dragon will light up the sky over the Atlantic before hopefully cooling off with a watery splashdown on March 8. 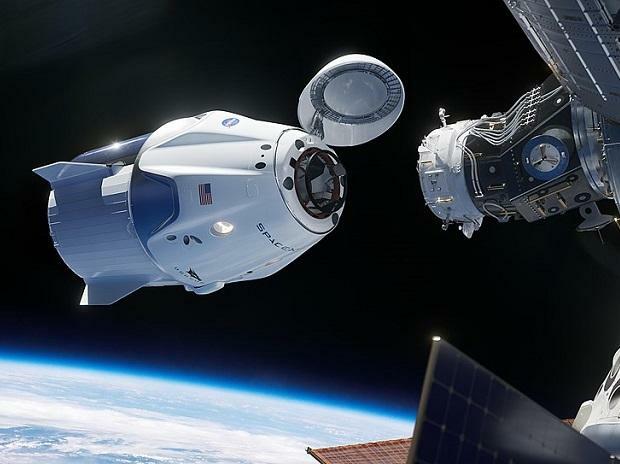 The SpaceX Dragon 2 capsule is of enormous significance for spaceflight as it has just become the first commercial vehicle to automatically dock with the International Space Station (ISS), and aims to carry astronauts there in a few months. Now it faces one of the most hazardous parts of its mission – returning to Earth safely. The ISS, and the now docked Dragon 2 capsule, are currently orbiting at a speed of 27,600km per hour, about 400km above the surface of the Earth. To give an orbiting object a safe landing, which is clearly particularly important if it is to carry astronauts, this enormous speed needs to be reduced to approximately zero as it reaches the Earth’s surface. This change in velocity is going to come from a mixture of rocket firing, friction, air drag, parachutes and finally water. A crucial aspect of achieving it is calculating what angle to bring the object in at through the atmosphere. The velocity of any object in orbit is the product of two components, one moving towards the centre of the Earth and the other in the direction of its orbit. So when the spacecraft reenters the atmosphere, its motion will be a combination of these. The first step in getting Dragon 2 home is to slow the orbital speed of the spacecraft down. This will be achieved by firing rockets against the direction of travel, steepening the angle of motion (see diagram below) until it dips into the denser regions of the atmosphere. The change in velocity required is in fact very small – one needs only to decelerate by roughly a 60th of the station’s speed. The Earth’s atmosphere will then do the rest. But the angle of entering the atmosphere matters. If it’s too steep, the capsule will experience excessive deceleration. If it’s too shallow, there will not be enough drag force to slow the craft down sufficiently for landing. It is even possible to end up skipping the spacecraft along the atmosphere, like skimming a stone on a pond. Therefore, the spacecraft needs to travel within a narrow range of possible angles called the “entry corridor”. As the capsule comes through the atmosphere, it will be pushing its way through increasingly dense air. This causes friction around the outside of the spacecraft, heating it up. Fundamentally, the physical process involved is a conversion of energy from kinetic (movement) to thermal (heat). The high reentry speeds also produce a shock wave in front of the spacecraft which heats the air to thousands of degrees. This is similar to air heating up in a bicycle pump as it is compressed. The heat generated can be higher than the melting point of the metals in the skin of the spacecraft, so a good heat insulator needs to be present to protect it. The Dragon spacecraft uses a carbon-based thermal protection system – a layer of ablative material which burns away, protecting the spacecraft. The importance of heat shielding was highlighted during the Columbia Shuttle incident, in which a tile was damaged on take off, resulting in the shuttle disintegrating upon reentry and killing the crew members. The heat generated will also depend on the entry angle. If the angle is too steep, the heat generated by the shockwave and friction at the front of the spacecraft will overwhelm the shielding, potentially causing the spacecraft to break apart or explode. Having said that, if all goes well, the advanced heat shielding materials used on Dragon 2 are expected to withstand hundreds of atmospheric reentry flights. Rapid deceleration also generates strong g-force. These are the forces you feel acting on your body during acceleration, such as on a roller coaster. One g is the equivalent to the pull of Earth’s gravity. In a standard Soyuz landing, astronauts experience up to about 6g. In one of the most extreme Soyuz landings in 2008, astronauts experienced over 8g, resulting in breathing difficulties and spinal compression for the crew. The human body has a limited tolerance to g-forces – most people will pass out at a sustained acceleration of 7g. As the Dragon 2 is designed to be the first commercial passenger spacecraft, the deceleration forces and heat tolerances must be demonstrably within safe limits on this test run. To test this safety for new astronauts, the Dragon 2 launch has a brave passenger. Ripley is a mannequin who is sat in one of the crew seats and will take data such as the internal temperature, pressure and g-forces experienced. This will ultimately determine if the reentry is safe for humans. Once deceleration due to friction has slowed the spacecraft sufficiently, the remaining velocity will be shed with a combination of parachutes and a splashdown in the Atlantic. When the Dragon 2 is ready to be crewed, the recovery procedure will likely be similar to the US missions of the 1960s and 70s. The capsule will float in the ocean and the astronauts are then picked up by ship or helicopter. Historically, this wait time for the crew has been anywhere between 30 and 90 minutes. Earlier designs for the Dragon 2 incorporated a powered landing, involving slowing down with rockets, similar to the recent Falcon-heavy booster rocket landings. But this is more costly and can be more dangerous. While the softer landing in water has its benefits, an alternative is to return to land. This is the approach being taken by Boeing’s CST-100 Starliner, which will use a combination of parachutes and airbags to reduce its landing velocity. The Starliner has its first ISS rendezvous test flight planned for next month, also unmanned. Like the Starliner, the Soyuz capsules (which have been running since the late 1960s) return to land. But they use small braking rockets at the last possible second to soften the landing, and are the most long-lived and successful spacecraft to date. The landing and recovery of the Dragon 2 will represent a crucial milestone in commercial space flight. If successful, it will be the first time that a private company has flown a human-rated spacecraft to orbit, docked with the ISS and returned it safely to Earth. If it succeeds, it will make a second test trip in July with NASA astronauts on board. Such an achievement will hopefully greatly improve our prospects for further human space exploration.